Strange Adfellows for Net Neutrality: AT&T and . . . Burger King? As the rumpus over the fate of net neutrality continues, it’s not just 21 states and the District of Columbia pushing back against the FCC decision to neuter neutrality. It’s also advertisers. Exhibit AT&T: This full-page ad that’s been running in major U.S. newspapers from the Washington Post to the New York Times. 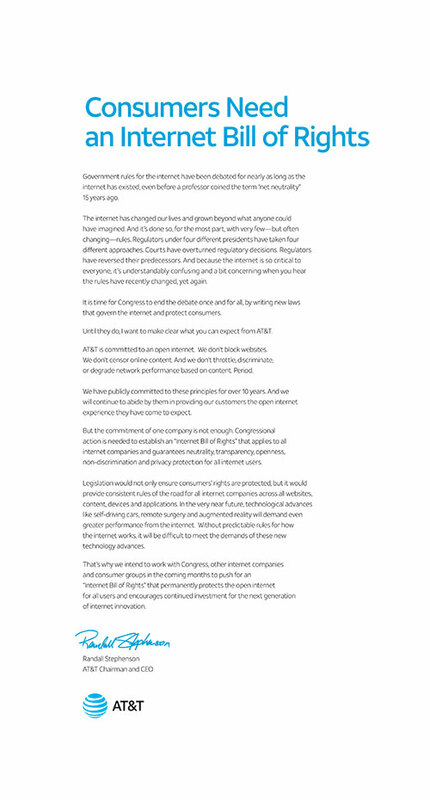 Congressional action is needed to establish an “Internet Bill of Rights” that applies to all internet companies and guarantees neutrality, transparency, openness, non-discrimination and privacy protection for all internet users. There are two schools of thought about AT&T’s campaign. This is a clever play by AT&T aimed not at protecting users, but kneecapping edge providers like Facebook and Google. It’s like the fox calling for a henhouse bill of rights. Full disclosure: The headscratching staff has no idea what that means. But this might help. [W]hat really gets [AT&T’s] goat is the runaway success of edge providers — that is to say, internet companies like Facebook, Amazon, Google, Microsoft and so on. The idea that these major companies, which handle all this personal data and are so critical to users of the web, have escaped serious regulation while ISPs are closely watched, this rankles the latter group to their core. Then there’s Rhett Jones at Gizmodo. Big telecom companies spent millions of dollars lobbying against the net neutrality protections that keep the web free and open. Since their victory, they all seem to want to reinstate net neutrality—on their own terms. On Wednesday, AT&T threw its weight behind legislation for an “Internet Bill of Rights” with full-page ads in major newspapers, and it’s adding a twist to the usual talking points. Following the repeal of Title II protections for the internet by the FCC in December, there’s been a public outcry that hasn’t gone unnoticed by lawmakers and telecoms. 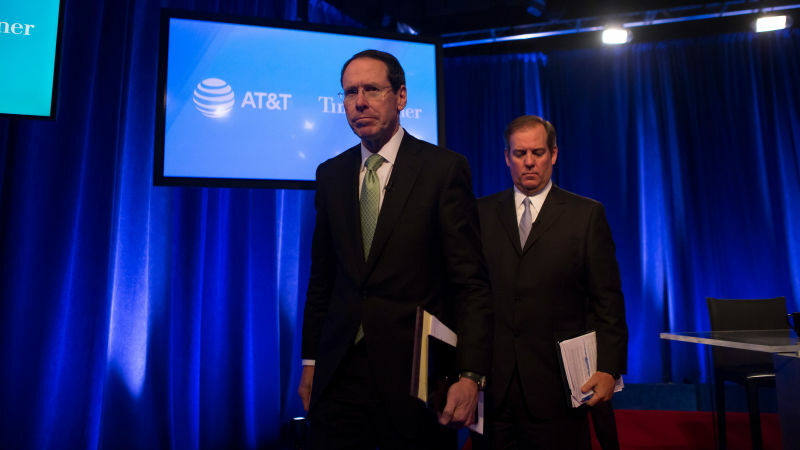 AT&T is just the latest company to flamboyantly proclaim that it loves net neutrality, despite the fact that the Sunlight Foundation reported it tied as the top spender trying to kill the regulations. Okay, so maybe that’s just one school of thought. Meanwhile, Burger King is running a net neutrality campaign that’s full of . . . what? Karlene Lukovitz at MediaPost provides the background. BK exposed some real, unsuspecting customers at one of its locations to a staged scenario in which they were told that they would have to pay different prices for a Whopper based on how quickly the burger was given to them (the “MBPS,” or “Making Burgers Per Second” speed). A “slow MBPS Whopper” cost $4.99, a “fast” one cost $12.99, and a “hyperfast” one cost a whopping $25.99. As for why a fast-food chain would weigh in on a potential slow-feed internet, Fernando Machado, BK’s global chief marketing officer, said this. The repeal of net neutrality is a hot topic in America, but it can be difficult to understand. We believe the internet should be like Burger King restaurants, a place that doesn’t prioritize and welcomes everyone. This entry was posted in Uncategorized and tagged AT&T, Burger King, Deven Coldewey, Facebook, Fernando Machado, Gizmodo, Google, Internet Bill of Rights, Karlene Lukovitz, MediaPost, net neutrality, New York Times, Rhett Jones, Sunlight Foundation, TechCrunch, Title II, Washington Post. Bookmark the permalink.